Cook stoves are an affordable, stylish, and dependable way to prepare food and heat your home off the grid. 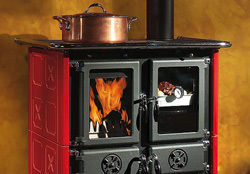 We found that the Canadian cook stove market was undersupplied by efficient yet elegant stoves at reasonable prices. To this end we have researched dozens of European manufacturers of wood cook stoves and found the best combination of quality, design, and price in La Nordica, Lincar, and Lacunza cook stoves. Unlike other Web sellers we import all our products ourselves directly from manufacturers and stock each model for quick shipping. We are authorized dealers of any brand we carry with after-sale support, parts, documentation, and manufacturer warranty. Please note: we do not have a physical showroom. Unfortunately there is no way to preview our products in person. We cherish your feedback! If you would like like to share your experience with your stove, provide tips for other users, write a review, make a video, or just take a picture please do not hesitate to contact us through the online form available on the Contact Us page.